Jane Lombard Gallery is pleased to present False Awakenings, James Clar’s first solo show in New York. 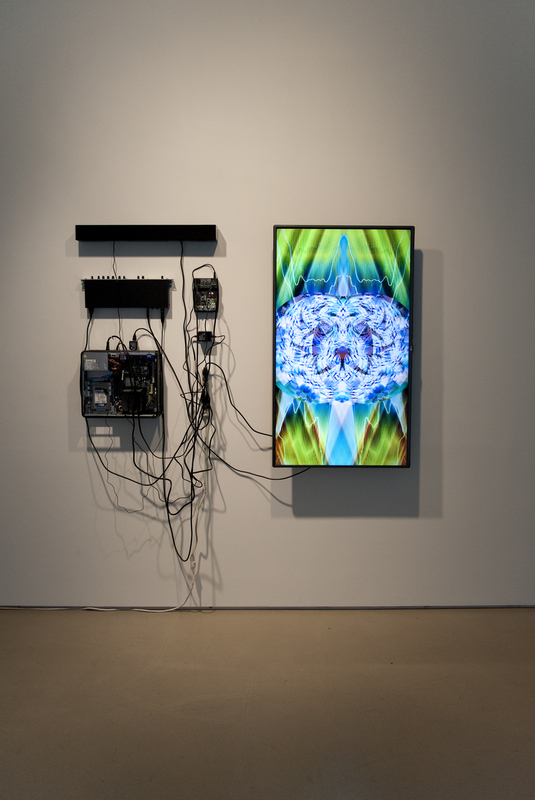 The exhibition will feature new works that continue the artist’s exploration of technology’s influence on our notions of perception and reality. 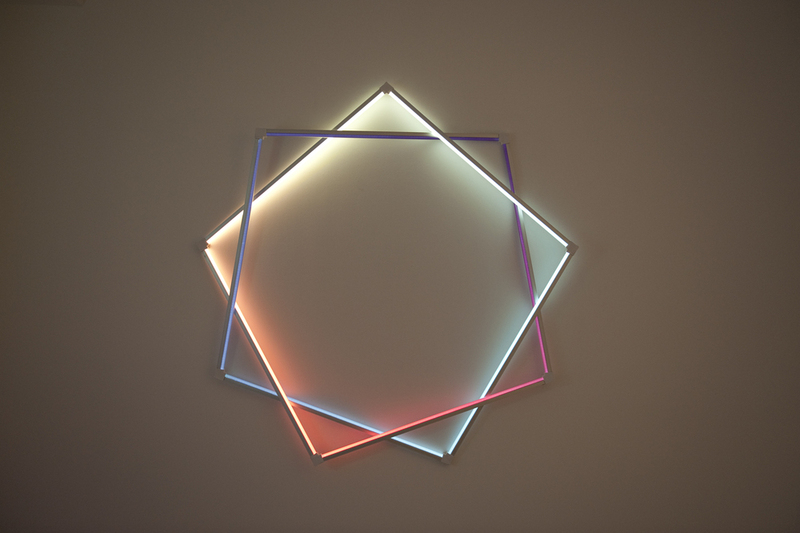 With a background in film and animation, James Clar approaches each sculpture as an alternative visual system to television or film. Rather than relying on those set mediums and working within their physical limitations, he manipulates light and video to create new visual systems that correspond to each concept. A "false awakening" is a vivid and convincing dream about waking from sleep, while the dreamer, in reality, continues to sleep. As the information we receive in our waking experience increasingly comes via interaction with computer systems and digital technologies, our physical reality becomes less concrete. Today’s increased prevalence of technology has significantly blurred the boundaries between waking reality, dream reality, and virtual reality; these areas of perceived consciousness have started to overlap and bleed into one another. The works in the show call attention to, and even exploit, our diminished and altered views of reality. In Nobody’s Home (2016), a door leans against the wall and light spreads out from the crack underneath it. The viewer perceives someone walking on the other side by watching the movement of light and shadow. However, that light is actually generated by a strip of LEDs integrated into the bottom of the door, creating moving light that tricks the viewer into perceiving a space and a person that exist beyond the door. Instead, the presence of an entire person is reduced to sliver of transmitted light. In Simulation of a Simulation (New York) (2016), Clar uses a high definition camera that is locked onto a constantly shaken snowglobe of New York City. The live image is sent to a connected television, displaying a generative animation of New York City in a snowstorm. By zooming in on a small area of the snowglobe and increasing its size significantly on the screen, Clar makes the city appear like a cartoon or computer animation. However, the tiny snowflakes moving around the snowglobe obey the laws of physics and gravity, creating a simulated, hybrid reality between the virtual and the real. With Rain Under Lamppost (2014), a projector is mounted near the ceiling in such a way that half of the video image grazes the wall before it hits the floor. This creates a cone of light similar to the cone of light that glows from a lamppost. 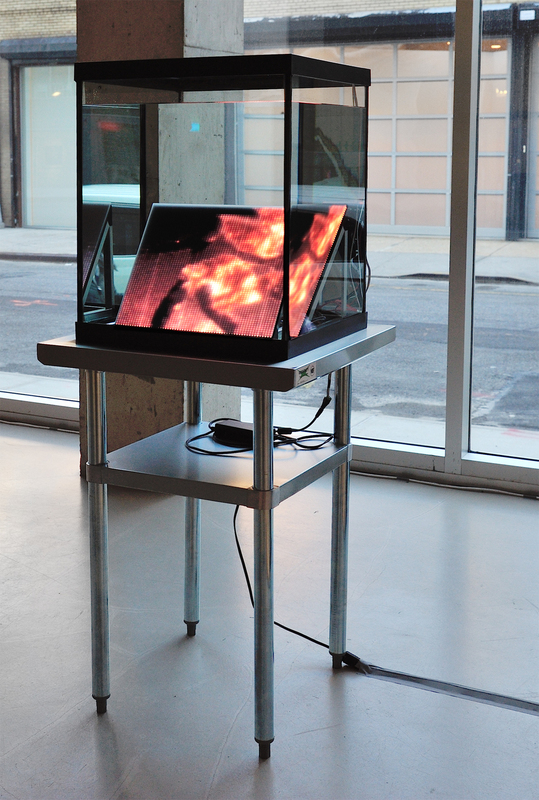 Using generative software, video is then sent through the projector to display a replicated image of rain falling through the cone of light. The work creates a simulation of volumetric space and hints at the split between virtual worlds and reality, while also creating a calm and reflective scene of watching rain passing through a beam of light. Through his body of work, Clar aims to analyze visual experience, human perception, and the elusive connections between them. Technology, for Clar, is an extension and expansion of our senses, subtly transforming our perception of the world around us until we can no longer discern natural from artificial experience. James Clar (b.1979 USA) studied Film &Animation at NYU’s Tisch School and received his Masters at NYU’s Interactive Telecommunications Program in 2003. His work has been exhibited at Pera Art Museum (Istanbul), Can Framis Museum (Barcelona), Seoul Museum of Art, Museum of Contemporary Art (Jacksonville), Sharjah Art Museum (UAE), “Rockaway!”exhibition by MoMA PS1 / Honolulu Biennial (New York), Chanel Mobile Art exhibition (Tokyo), Parasol Unit (London), The New Museum of Contemporary Arts (New York), The Chelsea Art Museum (New York), The Somerset House (UK), Museum on Seam (Jerusalem), and Louis Vuitton Gallery (Hong Kong). Clar was an artist in residence at Eyebeam Atelier in New York, Fabrica in Italy, and the FedEx Institute of Technology/Lantana Projects in Memphis. In 2012, after five years in Dubai, James Clar returned to New York where he now lives and works.